Preheat oven to 375 degrees. Lightly grease muffin tin. In a small bowl mix topping ingredients together until small clumps form. In a medium bowl combine the flour, baking soda, salt, and lemon zest. In a large bowl combine the sugars, milk, oil, lemon juice, and vinegar. Mix well. Add the dry ingredients to the wet ingredients, stirring until just combined. Do not over mix. Gently fold in the blueberries. 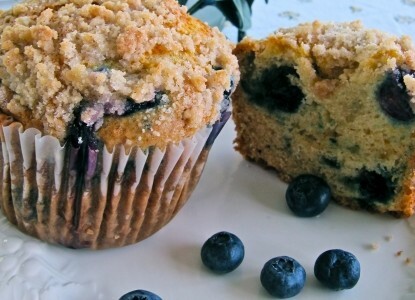 *If using frozen blueberries lightly dust them in flour first. Bake approx. 22 mins. for regular muffins, 30 mins. for jumbo muffins or until a toothpick inserted into the muffins comes out clean.